Ferrero Rocher has a new contest for Christmas! 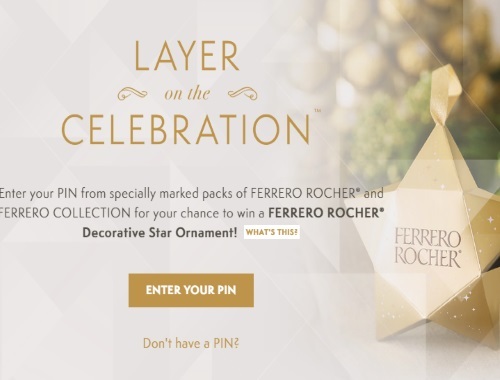 Enter to win a Ferrero Rocher Decorative Star Ornament that also contains 3 Rocher Fine Hazelnut chocolates inside! Enter a PIN from specially marked packs of Ferrero Rocher 200g and Ferrero Collection 156g chocolates for your chance to win instantly! There are 25,000 prizes available to be won. Contest closes January 31, 2017. Limit 1 prize, per person per household.